Our house is full of all types of gadgets but only one desktop computer. The kids are getting to the age where they need to use the computer more for homework, not to mention that they would like to use it more for games, so my husband and I recently started discussing purchasing a second desktop. Secretly I think my husband only agreed because he was tired of hearing me say, "I am going to need the computer" every time he sat down to use it. Because a new computer would be primarily for the kids, we knew for sure that we wanted it in a common area of the house where we could monitor the games they were playing and, more importantly, the sites they were visiting. The only problem is that in our current home there isn't a lot of extra space in those rooms. We knew we needed an all-in-one type computer, so that we didn't have to carve out space for a tower, and that we would prefer not to have cords hanging all over the place. It was about that time that I was contacted about reviewing the HP TouchSmart 320 with AMD Vision Technology. After checking out the computer online, we knew it fit all of our requirements and more. The HP TouchSmart 320 also had a touch display. I wasn't sure it would impress the kids, since they already have handheld devices of one sort or another with touch screens, but I personally I feel that activities that take advantage of a touch screen encourage more creativity and provide a better opportunity for interactive learning. A few days later when the kids got home from school they were surprised to find a new desktop waiting for them. Wow, was I wrong at how impressed they would be with the touch screen! I wish I would have caught my three year old daughter on video when she exclaimed, "You can click it with your finger? That is so COOL!" They have had free range for the past week to explore all of the fun features. They have used the webcam to talk to their dad, who travels for work, experienced games on their favorite sites in a new way, played a little too much Angry Birds, created slideshows with their pictures, and doodled masterpieces on the magic canvas. On the magic canvas you can draw pictures and write notes right on the desktop of the computer. The kids love using it to create their own backgrounds from their works of art, and I love that I can write notes for them that they can't miss. The computer is eventually going to make it onto the little island on my side of the kitchen where I stack all the kids' paperwork and the mail. I will be able to help them with homework, monitor their computer time, and even look up a recipe while cooking. Plus, since it already has a TV tuner, I can hook it up to our cable television service and watch TV on the 20 inch HD display or listen to music with Beats Audio. The video playback is really crisp and smooth with AMD's VISION technology. Now if only it would wash the dishes! You can check out the HP TouchSmart 320 for yourself, and once you decide that it needs to make its way onto your Christmas list, they are available at HP Direct for $599.99. And if you leave a comment on this post telling me how you think the HP TouchSmart 320 would change your life, you will be entered in a random drawing for a chance to win a new HP TouchSmart of your own, provided by HP. Each comment posted in response to the prompt garners an automatic entry into a random drawing for a new HP TouchSmart 320 provided by HP. Comments will be pooled from all blogs, as only one TouchSmart will be given away, click here to check out the other reivews. Prize and promotional support provided by HP. I was given a HP Touchsmart 320 for the purpose of reviewing and sharing my thoughts with you. All opinions are my own. Wow! I know it's a long shot to enter, but this would be awesome to win. It's like the best of all worlds with a computer + tablet combo! That would be AMAZING!!! My daughter constantly tries to touch the screen on my laptop and it would be so great to have a screen that she is supposed to touch! This would be so fun to play on with my toddler. We could easily use it together while I'm holding my newborn too (the laptop is very difficult to do this). I could really use one of those. I have 3 kids who all want to use the computer at the same time I do. I would love to win...thanks for a great giveaway!!! 5 kids and lots of homework w/ one computer...this would be so helpful. I might actually get more sleep because I won't be up either doing my thing on the computer, or helping someone else whose had to wait their turn. This would be great - we could finally get rid of the dinosaur currently residing in our computer room. It would be so nice to have a working computer in our home :) One dead laptop and the other on its way out is what we currently have. That one looks awesome! We have laptops at our house, but that means that our kids can't really use them. They know how to use a regular mouse, but can't really work the touchpad well. But being able to touch a screen would be fantastic! My 3 year old LOVES playing games on the computer but gets SO frustrated. This would make it MUCH more enjoyable for everyone! Awesome giveaway!! Would love to win. This would be super cool considering that our computer has seen better days. Thanks for sharing. I could get my seven year old to use the computer! This sure sounds awesome. We have 4 kids in middle and high school, all with text books online. We get quite the back up at homework time. Would love to win this! Awesome, we would love to win this! Winning this would be awesome! My middle child is just getting into the stream of technology and this would boost her right up there! How would it not change my life?!?!?!?! I am in LOVE! The touch screen would be great for my daughter. She loves playing games on my laptop. It would change my life because my current computer is a dinosaur, and the download times last an eternity! I would love to have the HP Touchsmart 320 because then I wouldn't feel like an idiot when I touch my non-touchsmart computer screen and expect something to happen! I just expect everything to be a touchscreen anymore that I forget that my own computer is a dinosaur. We soooo need a new computer! No doubt that TouchSmart is the future already here in personal PC's. Winning this would be so great, our computer is on its last legs. I would love to win this computer! This would be so awesome! I need an new computer really bad! My kids need their own computer. What a great giveaway. This would be a wonderful replacement for our old, slow, bulky desktop. The touchscreen would be great for my granddaughter. My kids would love a touch computer!! Oh my gosh, for neat! My almost-3-yr-old would love to try it out! I would LOVE to win this for my family!! I would no longer have to hear:make her get off the computer I need to use it. With 4 kids you hear that a lot! Wow what an amazing giveaway! I'd LOVE to win!!! We've been looking at computers for the same reason you were...the kids need it. Sure looks like a great one--would love to clear off some counter space for it! I would love to have this. Right now my husband is taking online classes, the kids and I have no access to a computer. It would be awesome to win this. My daughter's would LOVE this computer!!! This is a fantastic giveaway! What a christmas that would be! Our old deadbeat computer slugs along, but its almost about to be in the double digits in age, and this new amazing one would rocket us into the future! Our computer is in our living room too and there is a giant mess of cords under the desk that is always agitating me. This really would be awesome! This would be an awesome gift for my niece! Would love to have a new computer!! I need something like this, especially now my hubby is about to do a LOT more traveling for work! This is a fantastic giveaway! My little netbook is on it's way out, I would be so pumped/relieved/pumped to win this! what an awesome opportunity! thanks! We were looking into getting a computer for Christmas because the only one we have is my laptop and that is OFF LIMITS to the kids, but I totally want them to have the skills and the only way they'll get them is PRACTICE. This would totally change their lives! This would be a great tool to add to my Hypnotherapy business. I could use it to easily record therapy sessions and to store client data. It would also useful to have as I start blogging for Hypnotherapy. I would love love this..
That is so cool! Your girls look like they're having a blast!!! This would be so amazing to win. My family would love and us this computer soooooo much. I love the touch screen.. how cool.... and how handy to leave messages for others in the family on it. We don't have a desktop so this would be the perfect addition to our office. No more fighting over the laptop. It would change my life because we only have one computer...and my preschooler and toddler are always wanting to get on the computer while I'm on it. !! Oh, this would not only chance my Christmas, but would change my life! My computer is a hand me down, we bought our first computer in 1994! Yes, 1994! Then the next 2 were my hubby's work ones! The next one I bought for $5.00! Yup! Five Dollars! Sad! This one is my sons that I use now, so we really have not owned a nice computer since 1994. And they told me, "You will never need more than 4 rams.I don't ever know what that means even now, but I know when I check with the IT department at my work, they just laugh! But this would change my world! My hubby and I don't give present to each other, because we have boys. They are grown now, but both are going to school. So, there goes our extra anything!! This would chance a lot for us! Maybe it would be okay this year? But hey, we are very blessed!! So, please don't any go feeling sorry for us! We have 2 wonderful kids! And our some times health! FUNNY! What an amazing device! Thanks for the giveaway, would love to win! Oh, wow! I'd love to win this. I've been worried about my old computer & how long it can hold out. what an amazing computer and screen! My husband and I have been wanting to get a computer for the kids to use. But financially it isn't going to happen for years. My 4 oldest kids all have high functioning autism, and having a computer where they can look up everything that interests them and they are passionate about would be huge. Their favorite pastimes are art, design and programming. A computer like this would give them so much more access to those things. That's really cool. And great timing as we are also contemplating some sort of computer for DS that can be centrally located but take up very little space. What a cool "toy". I would love to give it a home. I would love to have this computer in our kitchen. That way we would have a communal computer instead of everyone going to their individual rooms to use theirs. Our current computer is on the brink of crashing. This. Looks. Awesome! What a wonderful computer for the whole family! This would definitely make my life easier. THe monitor is big so I can work on my graphics. The touchscreen is so much easier to work with. And we desperately need a desktop computer for our financal programs. All seven of my genius grandchildren would love to play with this when they come visit "Gran". This is a fantastic opportunity! A touch screen means no more mouse and no more little hands reaching for the mouse disrupting work flow. Thank you for a chance to win. this would really change my life -- our current laptop (a castoff from my work) is so slow and full. it's our only source for watching movies, sharing family photos, and the like and we are all so impatient when it takes five minutes to start up. My 7 yo daughter really needs to start becoming more computer savvy -- she's mastered the smartphone and the iPad but the HP Touchsmart would be a really fun way for her to learn and engage with technology. I would love to win this! It would be a fun new gadget for my family! Oh, my kids would looooove this. crossing fingers!!! I need it, Lorie. I need. I would LOOOOVE to use this with my kids in my classroom (Autism Support)...I've heard it can do WONDERS to teach them certain skills!!!! What an amazing computer. I've always been very impressed with HP computers that we've had. Their quality is always great. To make it so it is like a tablet on top of it? Amazing! I'd love to win this computer. My son is Autistic and a tablet is easier for him to use with his poor motor skills. This would be something that he, and his brothers, would absolutely love! Thank you for doing this great giveaway! I am in beginning process of getting my daycare license and think winning this would be awesome to help me with all aspects of getting my new business up and running! Thanks for the chance at this great giveaway! Wow! How Awesome this would be! If I won, I wouldn't have to listen to my husband ask every day if we could get a new computer! This is a great computer! This would be great to win so I get give my Mom my old one and then I'd have a new fancy one! This is so cool! I saw it in Sam's and was trying to decide which one I want on my Christmas list ... the iPad or this? This one is so visual with the touchscreen. I would love to have one!!! this would be really great for my daughter in high school. so much they have to do on the computer these days! thanks for the chance! Wow, this would be a sweet upgrade, I have no touch screens anywhere! lol The grandkids would also LOVE this! Please enter me too! Thanks!! This computer would be my first new computer in 8 years. We bought our old computer before my 8 year old son was born. It was a bit slow, but steady until it just died. My dad gave me his old computer and it is great except it sounds like a jet engine taking off at random times during the day. When my guests ask, "what is that noise? ", I tell them it's just my computer taking off and it will be back soon. This computer could be set up in the dining area and used as a shared computer. The HP TouchSmart 320 would fit practically anywhere, which opens up all sorts of possibilities. Oh yeah baby!! I have been researching our options for the exact same reasons you had. Would LOVE to have this! Having a touch screen would amaze my kiddos! My hubby is constantly telling them not to touch the tv and computer screen! We are at the same stage, with our oldest now in grade 2 and youngest in preschool - the laptop that my hubby has to travel with for work just isn't cutting it anymore! My kiddos would go bonkers over this!!! School work would be much for fun for them and me!! Our laptop is ready to bite the dust and we have not been paid in almost a year so this would be a HUGE blessing! Looks great! Would love to have one! Wow - this looks awesome. How would it change my life? Well, I think the touchscreen would make it much easier for my kids to use the computer (they're in pre-school) and I like the idea of them having a little more "freedom" from that perspective. Plus, my husband would love to play angry birds on something other than my little iphone! :) Thanks for the chance! I have a little boy who is really struggling. A computer like this would change our lives by allowing him a different way to learn. We would be so grateful to win something like this! I would love to win this! My husband's been checking out the TouchSmarts for a while now. This would be awesome to win, To be able to skype with my sister. She got married 2 years ago and they moved to Canada. So sad. Holy Moly!! This would be awesome for my new marketing job!!! I would love to win this. We are currently using a 8 year old desk top and would love to upgrade. Skpe with our grand kids would be an awesome bonus. Please! I would love to have a Touchsmart in my home! I would love to win this! Thank you for having this giveaway! Wow, what a giveaway! This would change my life because we haven't had a working desktop in years, and this looks like the one to own! The kids would be so excited if we won it! I would really love to win this HP Touchsmart! I have been looking at new HP computers in the past couple of weeks to decide which one to ask for my Christmas gift. If I win this, then I can ask for a top of the line HP printer to go along with my new HP Touchsmart computer! So, Please Pick me! 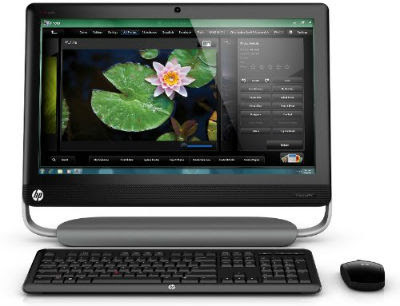 I would love to have a new HP Touchsmart 320 in our home. I babysit alot and the children would react the same way yours did, they love playing on my phone because its a touch screen. I also love making cards, editing pictures, and graphic designing on my laptops and my desktop and having this would help so much!!! Thanks for the review and the chance to win such a great computer. I need this computer.. it seems like a great idea. Wow, what an awesome computer and an awesome opportunity! I'll be crossing all my finger and toes for this one! Would so love to watch my girls create with this Touchsmart! It would be great to have my to do list on there and a list for the hubby... all in all, a great command center for my family. I would love this in my kitchen area! This would be great for our family. With our kids in middle and high school they both seem to need to use the computer for school projects and papers. Would also be nice to have in the kitchen area. Boys to work on would be awesome"
Would love to win this cool computer...oh the things the kids (and I) could do!! I want one!!! I'm going to tweet this..be back in a minute! Wow- awesome giveaway! Not that I ever win anything, but a girl can try! My kids and I would love to have a computer like this- especially since my laptop got dropped and shattered! This sounds perfect! My girls computer died a few months ago so this would be a blessing for us. No more fighting over using my computer. Thanks for the chance to win! This sounds so cool! And I really need something to replace the dead desktop now occupying my house! It can do so much!! It will be nice to finally give my kids a computer to do their homework on. Thanks for the chance! My 3 year old would LOVE this! She is learning to use the computer but the mouse (on laptop and desktop) and still very foreign to her. It would be great to have a touch screen. I would be able to use my computer having one for the kids. I would love to have this for my kids! So accessable! sounds like a great family computer! Just bought an HP Printer, but now I want THIS one! What a great HP computer! Like you my kids are using the computer more and more for homework, games and other things so winning this would make life so much easier around here. Thank you for the opportunity! This would be a Godsend to win! I would never be able to afford to buy a new PC, a new laptop, a tablet(Ipad), and the smartphone of the week, yet I need all of those things right now in order to not be unemployable at my age. This sounds like an awesome product! Our family would use this for many things - watching movies, listening to music, my son playing games, etc. Our computer has crashed a few times recently, so this would be fabulous. Thanks! With 2 broken computers and 3 kids desperate for screen time and a mom who wants the kids to be more comfortable with technology than she is, this computer would be perfect for our household!! This would be an amazing computer to win!! Looks pretty amazing! With two parents as students and three kids all loving and using the computer, having an extra would be awesome! This would so totally change my life! My hubby is an IT dude and my kids are in college and high school. Somebody is always needing to use the main computer! This would be perfect, since my laptop is on it's last leg! And the touch would be awesome! This looks amazing! I would love to have this!! Thanks! We need a computer like this because our son is getting ready to go to college and will need one!!! thanks for a chance to win! Wow! This would change my life by giving our family another computer to use! Great giveaway! It would be great to win this. Good luck all! Touch screens are just awesome. Thanks for the chance! WOW! We need a new computer and winning a computer would allow more money to buy Christmas gifts for our family! We sure could use a new computer and this one looks awesome! How cool! It combines a desktop and a notepad! I would LOVE LOVE this!! Thanks for sponsoring such a great giveaway! Have a blessed day!! Thanks for the chance to win! It would be a great Christmas present! Totally cool, I would love to win this. This would enhance my kids lives allow them their own computer to use for school projects. This would make their Christmas. I would use this computer--I am in need of one. I feel like all our computers are so ancient. But I am sure my daughter would steal it! I I have been looking for a computer to use at my new business opening in January and found my boyfriend playing withh a touch screen computer while I was researching. I loved it and thought it would be great for retail check out and appointment sign in at the yoga studio. LOVE HP products AND I needed this yesterday!!! How would winning this impact my life? for starters the screen is larger than my present tv! It would take up less space than my old clunker computer. I might learn to play Angry Birds! The touch screen would be easier for my OLD hands too. Truly? My daughter can create a story, a painting, a masterpiece!without her mama fussing about fingerprints damaging the screen! She(we) need this magic machine. It would help change my life because I would no longer have to look at the empty space reserved just for a computer like this. I've been dreaming of putting one of these in my kitchen. Then the kids would have their screen time right there with me present. This would be a blessing to win!!! This is such a great desk top to have. I'd like to use it for family computer. DDs would go crazy for this gift.